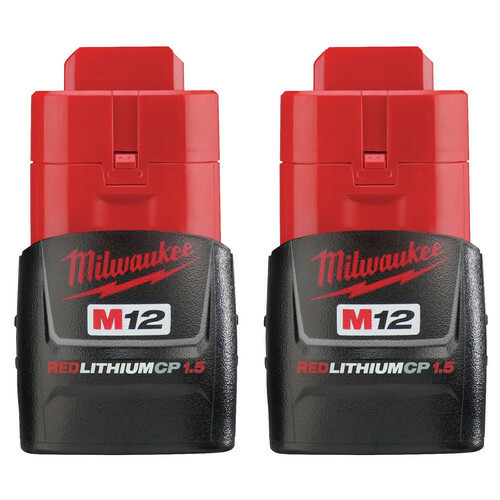 *Add a qualifying Milwaukee M12 item to your cart and the free item will automatically be added. Limit 2 free items per customer. Valid on select items, qualifying items are identified on the product page. Offer valid until 11:59pm ET on April 30, 2019 or while supplies last. No adjustments to previous purchases. Subject to change without notice. Max. Steel Drilling Capacity (Twist Bit): 3/8 in. Max. Wood Drilling Capacity (Auger): 7/8 in. Max. Wood Drilling Capacity (Hole Saw): 1-1/8 in. Max. Wood Drilling Capacity (Spade Bit): 7/8 in. this little drill/screwdriver works great for the guy/gal who likes to work around the property. I particularly like the click lock on the chuck. the battery last a lot longer than previous batteries. I find I am frequently checking the battery gauge and it still shows full charge. very nice tool. I have purchased one of these for each of my sons. replaced my old ni-cad drilldriver...what a great new tool....already had my neighbor but the same. I bought one from you folks a couple of years ago. I liked it so well, I got rid of my Ridgid and bought another Milwaukee. They are light weight, compact and the batteries last. use in aircraft to drill as well as remove screws and install. SMALLER THEN MOST 2 BATTERYS ALL GOOD TO ME!! Fantastic drill with the same power as my old 5 lbs DeWalt! I bought this drill as a lightweight compact drill for everyday use. I don't usually need the power to drill a 5" holesaw through 2" wood, and this isn't the drill for that, but it is fantastic for 99% of drill uses. It's much lighter than my old DeWalt 5 lbs workhorse, but has nearly as much power, which is amazing considering it's exactly half the weight. For 99% of homeowners this, or the Fuel brushless version, is the perfect drill. It won't last as long on a charge as the 18V stuff, but it won't kill your arm either. It's got enough power to drive a 3/8" lag bolt through 4" of pine, and enough finesse to drive hinge screws into cabinet doors. It's got more power than my old corded drills! If you are a professional who works with a drill for 8 hours a day, this drill would work great for putting in hinge screws or other light tasks, but if you do heavy duty stuff all day you may want an 18V drill (for battery life). For 3-5 hours of work the battery should hold up pretty well. The brushless version gets you more run time, a little more power, and is slightly heavier and should last a little longer overall. The only downside to this drill is that the batteries will not last as long as an 18V. The newer 2.0 batteries will help. Awesome buy. Looks brand new and performs like a winner! Just what I was looking for! Great purchase!! I bought this after a friend found it for me online. He is a long time Milwaukee user and recommended it highly. I'm so glad I bought it! I'm a 55 y.o. Female with small hands and this drill is great for me. Not too heavy but powerful. Easy to use and switch out bits. I've put 2 beds, a dresser and 2 shelving units together, so far, and I love it! How many batteries come with this drill? BEST ANSWER: I received two (2) batteries. charger and hard plastic case. So with the current deal to get a free 12v battery I would get 3? What is the weight of the drill? BEST ANSWER: This weighs 2.4 lbs.